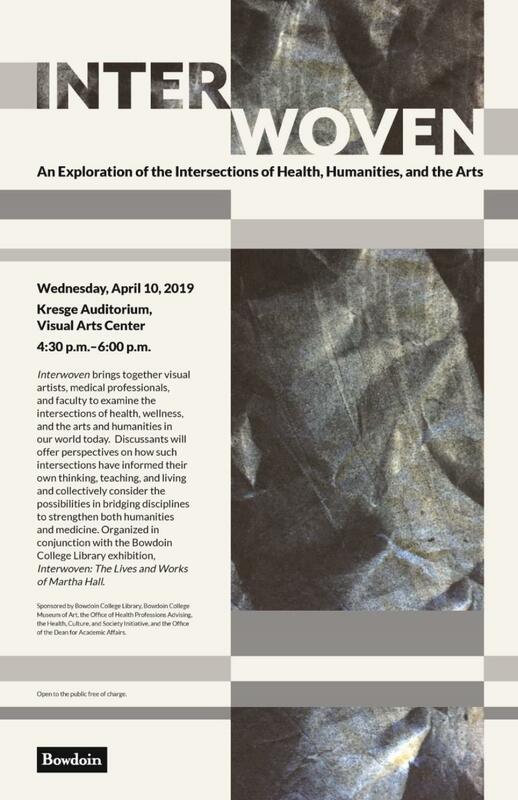 April 10, 2019 | Kresge Auditorium, VAC | 4:30-6:00 p.m.
Interwoven brings together visual artists, medical professionals, and faculty to examine the intersections of health, wellness, and the arts and humanities in our world today. Discussants will offer perspectives on how such intersections have informed their own thinking, teaching, and living and collectively consider the possibilities in bridging disciplines to strengthen both humanities and medicine. Organized in conjunction with the Bowdoin College Library exhibition, Interwoven: The Lives and Works of Martha Hall. Sponsored by Bowdoin College Library, Bowdoin College Museum of Art, Office of Health Professions Advising, Health, Culture, and Society Initiative, The Office of the Dean for Academic Affairs.